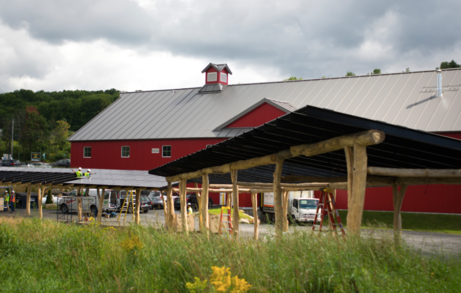 Vermont Artisan Coffee Roasters has installed a bank of SunCommon Solar Canopies to power their new facility while offering protection from the elements for their coffee bar customers and the cars in their lot. The canopies even offer shade to a popular picnic table area where visitors can enjoy views of the Green Mountains. Vermont Artisan Coffee & Tea is a provider of roasted coffees and exotic teas based in Waterbury Center, VT. Their new facility and coffee bar is the heart of their operations here in Vermont. At Artisan Coffee, they believe in farm direct sourcing, organic and fair trade products, and sustainability. SunCommon is proud to have partnered with such an outstanding local business to help them go solar.